"The first truly interactive cartoon" for children. 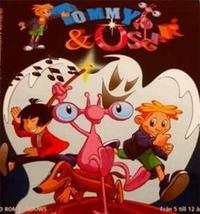 Welcome to Tommy and Oscar's world, where there is child's play to learn about the music! Play and Learn, 9 music video games, more than 60 minutes of cartoons, karaoke ready to record! The main character, Oscar, is an extraterrestrial who feeds upon music notes and the whole CD-ROM is designed as a fun way to teach the basics of music theory to children. In 1998, a TV series of 26 episodes with the same characters was made, as well as another tv series and movie later on.